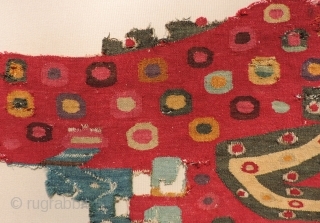 Spectacularly colored Incan tapestry tunic fragment unlike anything published. The circular spots likely represent the pelt markings of the jaguar. Jaguars can weigh of up to 350 pounds and are the largest cats in the Western Hemisphere. They are fearsome predators whose power and stealth was widely admired by Andean people who considered them sacred. 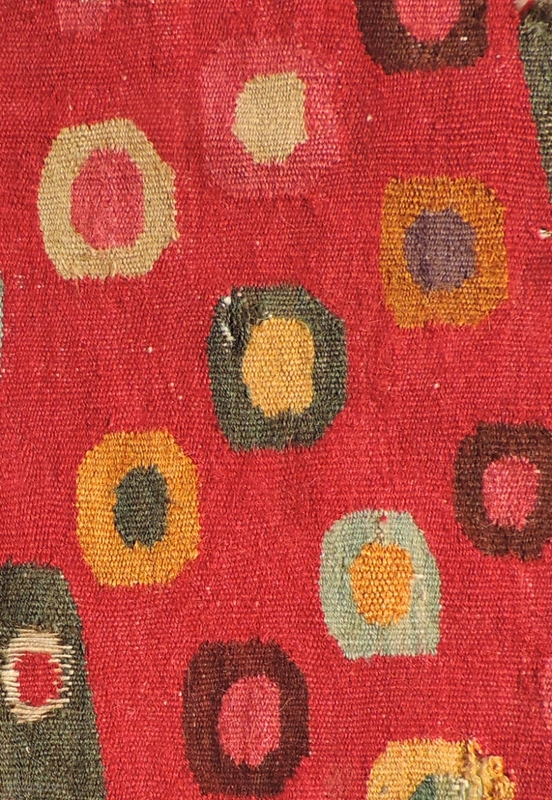 Shamans and elites in the high Andes danced jaguar pelts during religious rituals and ceremonies. This fragment has fantastic and varied color. It is not clear just what the original shirt must have looked like, but it is possible that the large green and yellow forms represent the tail of a jaguar. There is the intimation of a human figure with light blue rectangular shaped feet and an arm motif extending from a blue rectangular shaped tunic like garment, but this is speculative. 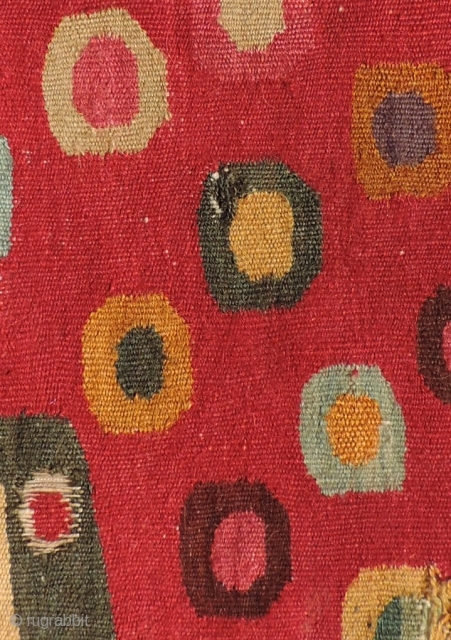 The remains of the original side seam is stitched together with a red "figure eight" type joining stitch - indicating that this fragment shows parts of both faces of the original garment. Whatever the design of the original tunic, this a was a highly eccentric example that had a range and brilliance of color rarely seen in such textiles and the colors are perfectly preserved. It has not yet been mounted, but it is clean and ready to go. Size: 15 x 10 inches. It packs a lot of punch for its size and is likely the only example one will see with this design and color quality. 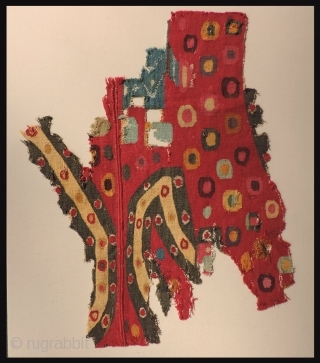 This is a sweet, magical little textile and an exceedingly rare Pre-Columbian tapestry fragment - a real charmer no less than 500 years old.